Alfredo Sáenz Abad, now 70 years old, has considerable experience of getting involved during a financial crisis. His portfolio includes steering Banca Catalana through the Spanish banking crisis of the 1980s, preventing it and Banesto’s demise. He is currently fighting to keep Santander afloat against the recession, holding on to the impressive growth it has seen during his tenure. Sáenz has had a long relationship with Santander. Joining in 1994 as a board member, he was appointed vice chairman and CEO in 2002. Upon becoming CEO, Sáenz’s task was fairly clear-cut. The bank was bleeding money to faltering economies in Latin America. Argentina in particular was suffering badly from debt and government corruption, which later led to rioting. This caused considerable problems for Santander, so Sáenz moved to decrease the bank’s exposure in the area, reducing the banks’ profile by cutting out sections that were under-performing. He also refused to give any more cash to the Argentinian arm of Santander. Sáenz then set an objective: make Santander one of the top ten largest banks in the world. Although the economic recession had crippled or stunted other banks, Santander was able to hold steady. Using the recession to the banks’ advantage, Sáenz proceeded to grow Santander by buying up other banks that had suffered during the recession. Santander hungrily absorbed a number of banks over the next few years. It purchased Abbey National in 2004, and in 2007 it bought both the consumer finance arm of RBS in the UK and GE’s consumer finance operation in Europe. 2008 saw the bank purchase both the UK’s Bradford & Bingley and Alliance & Leicester. In 2006 Santander had purchased parts of Sovereign Bancorp in the US, and it completed the full acquisition in 2009. These moves saw Sáenz push Santander to be one of the world’s largest banks – by 2008 Santander had reached its target; it was the seventh largest bank in the world by market capitalisation. Although Santander retained seventh place for 2009, it began to slip before long, and by 2012 the bank was ranked 14th. “Our business model continues to be valid and has grown stronger during the crisis.” Having remained profitable for more than three years during the global economic crisis, the banking giant is now feeling the strain. Its profits were cut in half recently as it struggled with a familiar situation – overexposure in countries with failing economies. He may regret saying that; Santander’s finances have since been hit badly in Spain, where the bank is setting aside piles of money as provisions against real estate loans. Last year, the bank faced a 35 percent reduction of profits caused by these provisions, and the trend has continued well into 2012 with the reduction jumping to over 50 percent. Sáenz’s solution is to stay the course and employ a strategy similar to the one he deployed when dealing with Latin America in the early 2000s: limit overexposure. Santander is hoping to clear up its problems in Spain by the end of the year, and if this goes to plan it may be nurtured to become as healthy as the Latin America markets. As CEO, Sáenz not only envisions the company’s objectives but also implements them – and he’s willing to get involved at all levels, stating: “You cannot be a leader without rolling up your sleeves.” But being too directly involved has caused Sáenz problems in the past. Back in 1993 Sáenz had recently been appointed as Chairman of Banesto, which had been rescued by the central Bank of Spain. His job was to lead a team recovering bad loans from debtors. 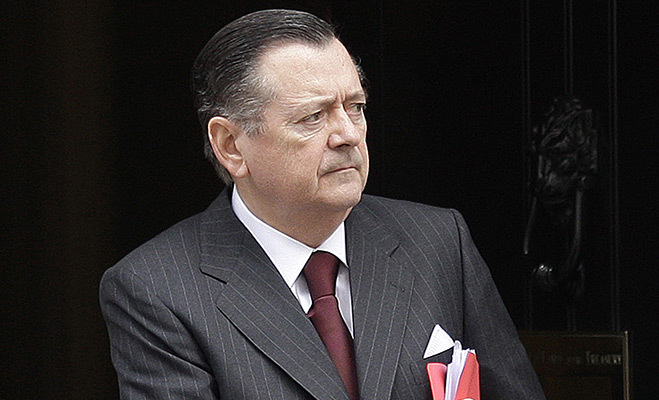 Sáenz was accused of making a false accusation against presumed debtors – a group of shareholders called Harry Walker. He lodged a criminal complaint against them to make them pay back debts of €3.8m. That complaint was later dismissed and the clients accused Banesto and Sáenz of filing a false criminal complaint. The case went on for 17 years, raising questions about the efficiency of the Spanish justice system. Sáenz was eventually sentenced to jail in 2011 and banned from banking for three months. Luckily for Sáenz and Santander, he was pardoned on appeal and instead made to pay a fine of an undisclosed amount. For now, it seems as though both Sáenz’s career and Santander are safe. Although the bank is not positioned perfectly, it is still healthy. Given he has learnt from the past crises and adapted a previously successful strategy, the bank has a good chance of surviving until the market stabilises – as long as Sáenz doesn’t decide to retire before then.